With a life-long passion to be in the writing industry, C. M. Walsh began her “professional” writing career in high school as a writer for the school newspaper. While the desire to write remained strong throughout the years, as a mother of five children, she put writing on the back burner and opted for college instead. C. M. received degrees in Psychology and Sociology from Maryville University and a culinary degree in 2007. Although success was knocking in the culinary world, she chose to use the love of writing and her hard-earned degrees to develop and start writing and publishing her works. As the author of Toenail Soup, (published in September 2018), a children’s’ book focused on a boy named Joey, C. M. delves into the genre head first. Joey is your typical seven-year-old who happens to love a unique, smelly soup his mom often prepares. It is his love of this special soup that causes him to face struggles at school. Joey takes the initiative to show others how wonderful the soup is and in turn opens the minds of others. C. M. Walsh resides in Michigan, just outside of Detroit with her husband, and youngest child and her dog, Annie. C.M. Walsh’s humorous tale for children, grades K-3, Toenail Soup, addresses the conflict kids often have between fitting in with their peers and feeling comfortable with themselves as individuals. As I looked at Joey’s assembled ingredients for Toenail Soup, I was really rather impressed, even if those Brussels sprouts did promise to give the soup a strange appearance and an even stranger smell -- things kids can definitely have fun thinking about. Joey’s story also illustrates the importance of trying new and different things, not just food or cooking, and seeing for yourself what you like or don’t like. If Joey’s recipe is anything to go by, I think he’ll be one of the hot new chefs in a few years, and I’ve got the feeling kids who are introduced to this book will be asking for Toenail Soup for themselves. Walsh’s story is an engaging one, and it’s a grand selection for story time. It’s also perfect for young readers to try on their own. Toenail Soup is most highly recommended. There are similar and unique qualities that we each possess. For the classmates of Joey Martin, they felt that he was strange. Why did they feel this way about Joey and tease him a lot? Because he loved toenail soup. In Toenail Soup by C.M. Walsh, just the idea that anyone could possibly like toenails made Joey’s classmates gag. Joey's classmates wondered how anyone would like to eat toenails because they are so smelly and gross. What they didn't realize is that actually it was a delicious soup. Joey decided to call it Toenail Soup because of his colorful imagination. The different types of ingredients and the smell reminded him of toenails. I loved this book because it displays the diversity that we bring to the table to makes things special. In the end, everyone realized that they were more like Joey than they thought. They also realized that when they tasted the soup, they couldn't stop eating it. Toenail Soup was delicious! Walsh did a great job showing how our uniqueness can help people to take risks in exploring things and ideas that are different than their own. The crunch, smell and the gunk collected around the toenails after a hard day at play was the vision behind this idea. Children will love reading this book because it will set their imaginations to visualizing how Toenail Soup would look, smell and taste. As an added bonus Walsh has provided the recipe for Toenail Soup. Joey is so in love with Toenail Soup, that he created a song. Classic! I have a test I use when I review books for kids. I use the book or story in an ESL (English as a Second Language) class in China. I used to use my own kids as testers but, sadly, they are adults now and balk when I try to read them a children’s story. When I read Toenail Soup by C.M. Walsh, my initial reaction was that I loved it. I knew the title would have universal appeal. I can’t think of a culture anywhere where the words “Toenail Soup” wouldn’t elicit at least a giggle. But would they get it? My kids in my ESL class in China did. They loved the story. They got several messages from it, all positive. They could relate to Joey and his friends and, most of all, they wanted an extra class in which we could make Toenail Soup. I think this book will be a hit with kids everywhere if C.M. Walsh can find a way to get it into their hands. Toenail Soup is funny. It teaches several important lessons. It is a well told story about being a kid as well as being yourself. Joey is a poster child for letting your imagination run wild sometimes. I loved the story, and I loved the artwork. The totally workable recipe for making Toenail Soup is a delightful bonus and kids are going to want to try making it, despite the yucky name. But be warned, some kids will be disappointed that no actual toenails are used... C.M. Walsh has a winner in Toenail Soup. I can’t wait to see what her next book is titled. Toenail Soup by C.M. Walsh is a delightful first chapter book for young readers that celebrates liking different things. 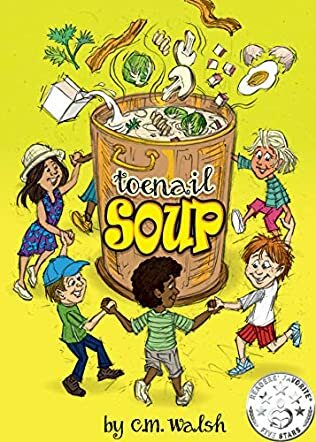 Toenail Soup brings to the forefront the topic of teasing at school as well as celebrating individuality and liking different things. Children teasing other children can make a child’s school life absolutely miserable, but Walsh doesn’t take the easy road by having Joey’s mother complain to the school. Instead, Joey finds a potential answer to his own problem, which also teaches an important life lesson in resourcefulness at a young age. Also, in today’s multicultural society, it’s important for young children to learn at an early age to be tolerant of other customs, traditions and foods and not immediately judge others for liking unfamiliar foods and customs. Walsh’s narrative is engaging and age-appropriate and her young protagonist is a typical little boy who likes to do what his friends like to do – with the exception of his odd food choices. The chapters are short and entirely appropriate for the targeted reader. There are rudimentary illustrations that complement the story and add visual interest. Overall, Toenail Soup is charming and gross enough to be the perfect first chapter book for any young boy. It’s also girl appropriate – if only to reinforce to all young girls out there how "icky" some little boys can be!